Although many people frequent Charlottesville in the spring and summer to tour wineries, we really can’t think of a better time to sip wine at a tasting room than the fall. Many of the wineries in Charlottesville have beautiful views of the mountains, and the fall only makes the views more vivid. One example of this can be seen at Grace Estate Winery, a beautiful spot just 10 minutes or so from the Inn. 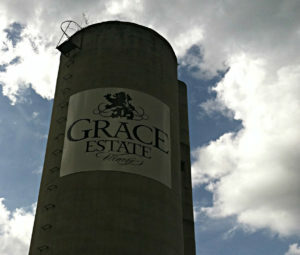 At Grace Estate, we love to head for a tasting right away. With 14 grape varieties, they have lovely reds and whites to suit any taste. Of course, as the weather cools down, we love to enjoy the reds, like their Tannat and Merlot. After we’ve tasted, depending on the weather, we’ll find a spot on the patio. If we have to stay inside, the tasting room is cozy, too. But the views of the mountains outside at this time of year are just beautiful, and often the weather is too, so more likely than not, we’ll order a bottle or a glass of something we like and sit outside. The patio is beautiful with views of the entire property and mountains in the backdrop. You can also sit out on the lawn area with your own picnic blanket, or at one of their picnic tables. The area is quite peaceful and scenic either way. If you think you’ll be hungry, there are cheese plates available for purchase or you can bring your own picnic. 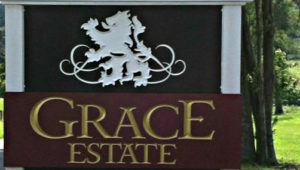 If you plan to visit Grace Estate, their hours on weekends are different than most wineries- they are open late on Fridays and Saturdays; Fridays until 9pm and Saturdays until 8pm. On Fridays they host local musicians and food trucks in the evening starting at 6pm, and on Saturdays they have local live music starting at 4pm. The vibrant evenings make this a great stop after you’ve toured a few other vineyards. Throughout the month of September, Grace Estate stays open 7 days a week, so whatever days you stay with us, you don’t have to worry about missing this beautiful vineyard and it’s perfect fall views! Keep up with us by Following us on Facebook, Instagram and Twitter! This entry was posted in Charlottesville, Charlottesville VA, Fall, Wine, Wineries and tagged charlottesville, charlottesvilleVA, wine, winery by Foxfield Inn. Bookmark the permalink.